Few Days are left in 63rd Independence of India that is on 15th August 2010 and there is Violence once again on Streets of Occupied Kashmir after Indian Troops Martyred More Kashmiris. It is also a Reminder on 63rd Independence of India that Kashmiris don,t Consider themselves part of India even after 63 years and even today they are raising slogans of Freedom. 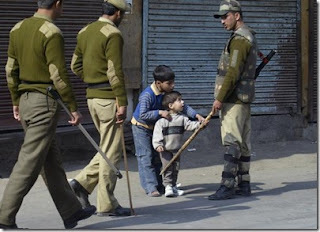 In Last few weeks some of the biggest Protests has taken place in different parts of the Kashmir specially the Kashmir Capital Sri Nagar after Killings of innocent Kashmiris by Indian Troops. The Large Number of the Protesters is Youth that is continuing the Movement of their Elders of Freedom from Illegal Indian Occupation. more than 15 Protesters have been killed in month of August by Indian Troops in different parts of Kashmir and Hurriyat Leader Syed Ali Geelani is arrested once again by Police.